The White-eyes are an old, traditional family. The 'traditional' white-eyes were mostly homogeneous, Old World tropical group of small arboreal birds. The name comes not from a white iris, but from a white-feathered ring that is a prominent feature around a dark eye of otherwise plain little green birds. Some white-eyes are montane specialists, as is the Mountain White-eye (left) on the Philippines. On larger Philippine islands, three species of white-eyes divide up elevational zones. Where that occurs, this species is always at the highest elevation. Some other standard characters of these white-eyes include a brush-tipped tongue for feeding on nectar (along with insects), semi-pendant nests, and (where known) pale blue or white eggs (Coates 1990). But genetic evidence showed that white-eyes, such as this Silver-eye (right, shown eating a crab-apple on Heron I. which is part of Australia's Great Barrier Reef), were also "babblers" in the broad sense. Alström et al. (2006) would apparently combine all the obvious babblers with the Sylvia warblers, the white-eyes, the parrotbills, and the Wrentit of the New World to form one huge Timaliidae Family. Under that approach, the family would have about 390 species. Jønsson & Fjeldså (2006) took a different approach. They divided this huge group into two "clades" [evolutionary lineages] that are each others closest relatives. If one were to assign Family rank to each "clade," there would be the Babbler Family [Timaliidae] of ~340 species, which included the White-eyes, and a second Family that includes the Sylvia 'warblers', the Wrentit, various babblers, and almost all of the parrotbills (also once considered a separate family). A growing consensus (e.g., Cibois et al. 2010), grounded in the work of Gelang et al. (2009), proposes to split Babblers into five families. One of these is the Zosteropidae again, with ~125 species. However, the "new" Zosteropidae includes more than just white-eyes (more on those below). Still, about 80 species (including recent splits), some 64% of of all white-eyes, are placed in the genus Zosterops. These small birds are often found in chattering flocks moving through the canopy. Some are common and widespread, but there are a good many rare or endangered species in the group, including 21 (nearly a quarter of all species) that were threatened enough to warrant accounts in Collar et al. (1994). White-eyes are widely distributed in the Old World, with continental representatives in Africa, Asia, and Australian, but there are an inordinate number of island specialties. More than two-thirds of all white-eyes occur on only rather small islands (excluding New Guinea, Borneo, Sumatra, Madagascar, and the larger Philippine islands). There are two white-eyes endemic to tiny Lifou Island in the Loyalties off New Caledonia, and many species seem to be described in Clements (1991) like this for the White-throated White-eye Z. meeki: "Uplands of Tagula Island (off se New Guinea). Status unknown." No wonder I've seen only about a third of the world's white-eyes! Each of the islands in the Gulf of Guinea, Africa, has its own endemic: four species of Speirops (a genus that likely should be submerged into Zosterops). Most of the islands in the Indian Ocean have their own white-eye. Some of those representatives, like the Seychelles White-eye Z. modestus (which I poorly photographed in 1992), have declined during the last years of the 20th century to endangered status. Others, like the Réunion Olive White-eye (right), are still doing fine. All of the white-eyes I've photographed have broad white eye-rings, but a fair number do not, and sometime go by names such as "Black-eyes." [Chlorocharis in the Philippines is called Blackeye; Tephrozosterops is called Darkeye]. There is a unique little bird on w. Timor which has been called Timor White-eye (Clements 1991), Spot-breasted White-eye (Sibley & Monroe 1991), Spot-breasted Black-eye, Spot-breasted Heleia [IOU], and Timor Ibon. Barbara Magnuson, who has seen this species with a Ben King tour, tells me that birds leap-frogged over one another, recalling New World manakins. It and a related species on Flores are in their own genus (Heleia). Heleia, along with such genera as Rukia in Micronesia, Megazosterops in Palau, Oculocincta on Borneo, and Woodfordia in the Solomons, lack eye-rings. Six species in genus Lophozosterops are also atypical, as are the monotypic genera Apalopteron, Cleptornis, and Madanga. The DNA evidence places these odd genera in the Zosteropidae (Sibley & Monroe 1991, Gelang et al. 2009), but most of these taxa are rather little known. None act like typical white-eyes, and so the word "White-eye" in their name is misleading. For that reason, Ben King has suggested the Tagalog word for "small bird" as an appropriate moniker for the Philippine oddities: "Ibon." I applaud "Ibon" as a wonderfully coined choice! The exception to the genetic evidence about the relationship of these odd white-eyes is the case of Cinnamon Ibon Hypocryptadius cinnamomeus on the island of Mindanao. Fjeldså et al. 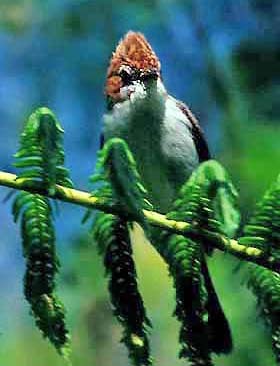 (2010) showed it was not related to white-eyes at all; rather, it was a forest canopy sparrow related to Passeridae! Yet it diverged from its closest sparrow relatives ~31 million years ago, and I feel it is most consistent to assign it its own family [Hypocryptadiidae], given the age of its divergence. Genetic evidence (e.g., Gelang et al. 2009) found that all the "babblers" on the Philippines (assigned to genus Stachyris) were actually more closely related to white-eyes, and these are now placed in the Zosteropidae. Among them is the spectacular and endangered Flame-templed Babbler (left), found only on Negros and Panay. It is now placed in genus Dasycrotapha, along with two species of Philippine pygmy-babblers. Four species of Philippine striped-babblers, plus Chestnut-faced Babbler, are now in genus Zosterornis. The more widespread and familiar Philippine babblers — Golden-crowned Babbler, Black-crowned Babbler, and Rusty-crowned Babbler — are now in genus Sterrhoptilus. The final 11 species now assigned to Zosteropidae are the yuhinas of Asia (genus Yuhina), ranging from the Himalayas to the Greater Sundas. 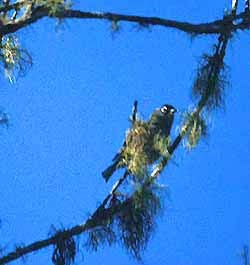 An example is Chestnut-crested Yuhina (right), on Mt. Kinabalu on Borneo. Most of the yuhinas resemble American titmouses in their behavior and short crests, but they are more colorful. They are small birds, forage in the canopy, and it is fairly easy to see a relationship to white-eyes. There is a striking exception in this 'traditional' genus. What was once known as "White-bellied Yuhina Y. zantholeuca" has proven to be most closely related to New World vireos! (Cibois 2003, Alström et al. 2006). It is now called Erpornis Erpornis zantholeuca. For the moment it is placed among the Vireonidae, but another set of Asian birds, the shrike-vireos (genus Pteruthius) also have proven to be related to vireos (Reddy & Cracraft 2007). Yet they diverged eons ago, and I have tentatively placed the shrike-vireos in their own family. It may be that Erpornis should also be raised to Family level. More research is needed on all the yuhinas and the rest of the Asian "babblers." Photos: The Mountain White-eye Zosterops montana was on Mt. Katanglad, Mindanao, Philippines, on 24 Dec 2005. 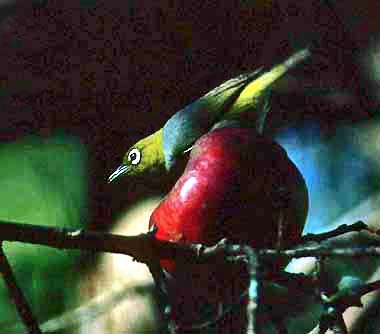 The Silver-eye Zosterops lateralis was eating a crab-apple on Heron I., Great Barrier Reef, Australia, in Sep 1983. 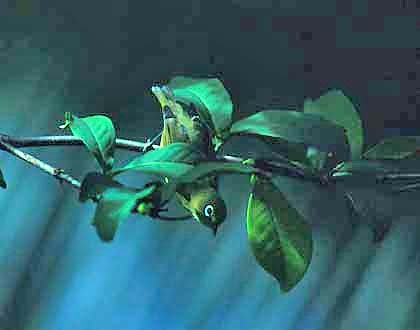 The Caroline Islands White-eye Zosterops semperi was photographed on Moen I., Truk Lagoon, Micronesia, on 31 Aug 1978. The Réunion Olive White-eye Z. olivaceus was in the forest above Le Brulé, Réunion I., Indian Ocean, on 4 Dec 1992. Flame-templed Babbler Dasycrotapha speciosa was on Mt. Canloan, Negros, Philippines, on 17 Dec 2005. The Chestnut-crested Yuhina Yuhina everetti was on Mt. Kinabalu, Sabah, Malaysian Borneo, on 5 Aug 1988. All photos © Don Roberson; all rights reserved. There is no recent "family book" covering the White-eyes but the Handbook of the Birds of the World account (van Balen 2008) is excellent, with great photos, although it is not quite up with the most current taxonomic findings, some of which postdate its publication. Alström P., P.G.P. Ericson, U. Olsson, and P. Sundberg. 2006. Phylogeny and classification of the avian superfamily Sylvioidea. Molecular Phylogenetics & Evolution 38: 381-397. Birdlife International. 2000. Threatened Birds of the World. Lynx Edicions, Barcelona, Spain. Cibois, A. 2003. Mitochondrial DNA phylogeny of babblers (Timaliidae). Auk 120: 35-54. Cibois, A., E. Pasquet, and T.S. Schulenberg. 1999. Molecular systematics of the Malagasy babblers (Timaliidae) and Warblers (Sylviidae), based on cytochrome b and 16S rRNA sequences. Molec. Phylog. Evol. 3: 581-595. Cibois, A., M. Gelang, and E. Pasquet. 2010. An overview of the babblers and associated groups. Systematic Notes on Asian Birds 68: 1-5. Cibois, A. 2003. Mitochondrial DNA phylogeny of babblers (Timaliidae) Auk 120: 35-54. Clements, J.F. 1991. Birds of the World: A Check-List. 4th ed. Ibis Publishing, Vista, CA. Collar, N.J., M.J. Crosby, and A. J. Stattersfield. 1994. Birds to Watch 2: The World List of Threatened Birds. Birdlife Conserv. Ser. 4. Birdlife Intern'l, Smithsonian Inst., Washington, D.C.
Gelang, M., A. Cibois, E. Pasquet, U. Olsson, P. Alström, and P.G.P. Ericson. 2009. Phylogeny of babblers (Aves, Passeriformes): major lineages, family limits and classification. Zoologica Scripta 38: 225-236. Jenkins, J. M. 1983. The Native Forest Birds of Guam. Ornithol. Monogr. 31. A.O.U., Washington, D.C.
Jønsson, K.A., and J. Fjeldså. 2006. A phylogenetic supertree of oscine passerine birds. Zoologica Scripta 35: 149-186. Keith, S., E. Urban, and C. H. Fry, eds. 1992. The Birds of Africa. Vol. IV. Academic Press, London. MacKinnon, J., and K. Phillipps. 2000. A Field Guide to the Birds of China. Oxford Univ. Press, Oxford. Pratt, H. D., P. L. Bruner, and D. G. Berrett. A Field Guide to the Birds of Hawaii and the Tropical Pacific. 1987. Princeton Univ. Press, Princeton, N. J.
Reddy, S., and J. Cracraft. 2007. Old World Shrike-babblers (Pteruthius) belong with New World Vireos (Vireonidae). Molec. Phylog. Evol. 44: 1352-1357. Sibley, C. G., and B. L. Monroe. 1990. Distribution and Taxonomy of Birds of the World. Yale Univ. Press, New Haven, CT.
van Balen, S. 2008. "White-eyes (Zosteropidae)," pp. 402–485 in Handbook of the Birds of the World (del Hoyo, J., A. Elliott & D.A. Christie, eds). Vol. 13. Lynx Edicions, Barcelona, Spain.